Jeremy is a British Writer and Screenwriter who is currently living in the United Kingdom (UK), in the rolling countryside of Somerset with his wife Veronica. He is still writing and providing many different scripts for various plays world wide, in fact he was involved in writing the 1960’s ‘The Avengers’ series, which was a huge hit to the television industry in the UK. 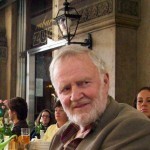 Jeremy also participated in writing other British television programmes here in the UK such as ‘Minder’ and ‘Inspector Morse’ – he contributed many different scripts and developing the narrative of the story. Jeremy was educated at Stowe, and at Pomfret School in the UK, he attended a year on a English Speaking Union Scholarship, and then continuing his career onto becoming a very well-known UK Writer, Actor and Author. Jeremy then went onto collaborating with another author named Trevor Ray, both had created a cult TV series named ‘Children of the Stones’ which was broadcasted on the ITV network in late 1960’s. Due to the success of the series, Jeremy had continued his work to create ‘Return of the Stones’ which is a continuation of the original. We have a pages specifically for both series, if you would like to take a look you are more than welcome, all our books are for sale. If you are interested in Jeremy Burnham’s work then feel free to browse around and take a look at the other projects he was involved in. If you are looking to purchase a book to read in your personal time, then you are more than welcome. You can check out his About page, and if you are looking to contact Jeremy direct, you and do so Here.